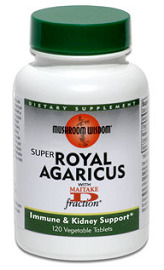 A combination of whole Maitake mushroom powder and standardized active glycoprotein in a capsule form. 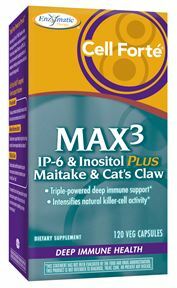 This product is suitable for regular health maintenance support for healthy people. 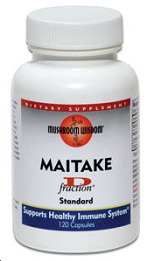 For other purposes Maitake D-Fraction Professional Strength is recommended. Maitake mushroom (Grifola frondosa) is an edible tasty mushroom prized in Asia for centuries. 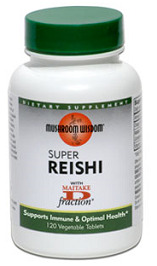 Since the 1980s Maitake has been a subject of scientific studies, and researchers found that it supports healthy immune function, healthy blood glucose levels and healthy blood pressure. 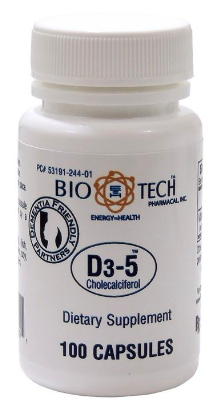 The active proteoglucan, often referred to as D-Fraction by scientists, is a unique beta-glucan conjugated with protein, which has been identified and isolated as a responsible substance for the potent immune-activating property of the mushroom. Maitake D-Fraction is the registered trademark of Mushroom Wisdom, which holds the exclusive right to use the trade name. Other Ingredients: Gelatin, Microcrystalline Cellulose, Dicalcium Phosphate, Silicon Dioxide. CONTAINS NO sugar, yeast, mold, corn, salt, wheat, soy, artificial color, dairy foods, preservatives, synthetic pesticides or fertilizers.